Lauded by Daily Telegraph (UK) for his “searingly poetic lyricism” violinist Philippe Quint is carving an unconventional path with his impassioned musical desire for reimagining traditional works, rediscovering neglected repertoire to commissioning works by contemporary composers. His dedication to exploring different styles and genres with an award winning discography has solidified him as one of the foremost violinists of today. Receiving several Grammy nominations for his two albums of Korngold and William Schuman Concertos, Mr. Quint is in constant demand worldwide appearing with major orchestras at venues ranging from the Gewandhaus in Leipzig to Carnegie Hall in New York. Philippe Quint plays the magnificent 1708 “Ruby” Antonio Stradivari violin on loan to him through the generous efforts of The Stradivari Society®. Highlights of the 2015/2016 season included performances with Colorado, Seattle & North Carolina Symphonies, Luzern’s Zaubersee Festival with pianist Marc-Andre Hamelin, and a first visit to Verbier Festival performing with Joshua Bell and Tabea Zimmerman among others. 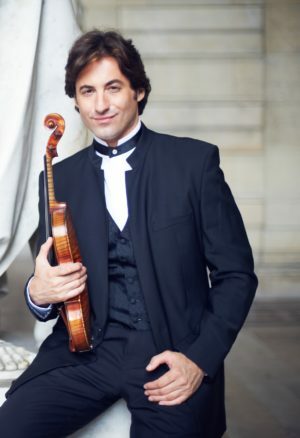 At the invitation of Maestro Vladimir Spivakov, Philippe opened the 28th edition of Colmar Festival dedicated to Jascha Heifetz with Tugan Sokhiev conducting the Orchestre National du Capitole de Toulouse in a performance of Korngold Violin Concerto. Earlier this year he was part of the opening of Mary B. Galvin’s new hall in Chicago hosted by Renee Fleming. Winner of the “Ambassador of Arts” award in 2014, presented to Philippe by Brownstone and Gateway Organizations at the United Nations last March, his 2014-2015 season highlights included debuts with Seattle Symphony with Ludovic Morlot, Milwaukee Symphony with Edo de Waart, Kansas Symphony with Michael Stern, Vancouver Symphony with James Gaffigan, and returns to San Diego Symphony with Jahja Ling and Indianapolis Symphony with Krzysztof Urbanski. Two new exciting recording releases took place in the 2015/16 season: original arrangements of Bach’s music by composer/pianist Matt Herskowitz titled “Bach XXI” which debuted at Lincoln Center in February of 2016 and a recording of both Glazunov & Khachaturian Violin Concertos with Bochumer Sinfoniker and Steven Sloane conducting for AvantiClassic label which received “Album of the Week” by Norman Lebrecht’s Slipped Disc. Mr. Quint’s 2013-2014 season included debuts with the London Philharmonic, Los Angeles Philharmonic, Rochester Philharmonic, Phoenix Symphony, San Antonio Symphony among others. His recording of the Tchaikovsky Violin Concerto with the Sofia Philharmonic led by conductor Martin Panteleev, paired with Anton Arensky’s String Quartet No. 2, Op. 35 (for violin, viola, and two cellos) featuring cellists Claudio Bohorquez, Nicolas Altstaedt and violist Lily Francis was released in September 2014 on AvantiClassic which “Gramophone” described as “conspicuously persuasive, dazzlingly assured” performance. In the summer 2015 he hosted the 2nd Annual Benefit “Philippe Quint & Friends” at Carnegie’s Zankel Hall presented by the Russian American Foundation. The first benefit concert took place at the New York Times Center in 2014 and featured John Corigliano, Joshua Bell, Michael Bacon, J.Ralph and Emily Bergl. Along with Lou Diamond Phillips, Darren Criss and Lea Salonga, Philippe appeared at the Kennedy Center’s “After the Storm” Benefit Concert for Philippines and debuted at the Hollywood Bowl as a part of a special “Joshua Bell & Friends” concert. Constantly in demand worldwide, Quint’s most recent appearances include performances with the orchestras of London, Los Angeles, Chicago, Detroit, Indianapolis, New Jersey, Minnesota, Bournemouth, Houston, Weimar Staatskapelle, Royal Liverpool, China National, Orpheus, Berlin Komische Oper, Leipzig’s MDR at the Gewandhaus. He has performed under the batons of Marin Alsop, Carl St. Clair, Daniel Hege, Grant Llewellyn, Andrew Litton, Cristian Macelaru, Kurt Masur, Jorge Mester, Edo de Waart, Jahja Ling, Krzysztof Urbanski, Ludovic Morlot, Marco Parisotto, Martin Panteleev, Carlos Miguel Prieto, Tugan Sokhiev, Klauspeter Seibel, Christopher Seaman, Kenneth Schermerhorn, Steven Sloane, Michael Stern, Bramwell Tovey, and Martin Yates among many others. Philippe Quint is the first classical artist to star in the lead role of a major independent film Downtown Express co-starring Nellie McKay from producer Michael Hausmann (Gangs of New York, Brokeback Mountain and Amadeus) and multi-Emmy winning director David Grubin. This 2012 film premiered in New York and Los Angeles as well as at a number of national and international film festivals including Woodstock, New York, Houston (Opening Night), Mons (Belguim), Cuba, Vermont, and Florida. Philippe Quint’s formidable discography includes a large variety of rediscovered treasures along with popular works from standard repertoire. In November 2013, he released to critical acclaim Opera Breve CD with pianist Lily Maisky, a unique collection of opera transcriptions for violin and piano featuring both popular and rare songs, on Avanticlassic. An active chamber musician Philippe frequently collaborates with cellists Alisa Weilerstein, Gary Hoffman, Carter Brey, Nicholas Altstaedt, Claudio Bohorquez, Zuill Bailey and Jan Vogler, pianists William Wolfram, Inon Barnatan, Alon Goldstein, Marc -Andre Hamelin, Simone Dinnerstein, Jeffrey Kahane, violists Nils Monkemeyer and Lily Francis as well as his esteemed violin colleagues Joshua Bell, Cho–Liang Lin & Vadim Gluzman. Philippe has appeared at the Mostly Mozart, Verbier, Luzern, Caramoor, Colmar, Ravinia, Aspen, Rome, Moritzburg, La Jolla, Lincoln Center and Chautauqua festivals and in recital and chamber performances at the Kravis Center, UC Davis Presents, National Gallery in Washington and most recently at San Francisco Performances with Composer/Pianist Lera Auerbach. Born in Leningrad, Soviet Union (now St. Petersburg, Russia), Philippe Quint studied at Moscow’s Special Music School for the Gifted with the famed Russian violinist Andrei Korsakov, and made his orchestral debut at the age of nine, performing Wieniawski’s Concerto No. 2. After moving to the United States, he earned both Bachelor’s and Master’s degrees from Juilliard. His distinguished pedagogues and mentors included Dorothy Delay, Cho-Liang Lin, Masao Kawasaki, Isaac Stern, Itzhak Perlman, Arnold Steinhardt and Felix Galimir.